4 DVDs · 7 hrs. 30 mins. COVERS THE MOST RECENT EXAM! TAKE THE STRESS OUT OF LSAT SUCCESS! Your score on the Law School Admission Test can make or break your chances of getting into the law school of your dreams. 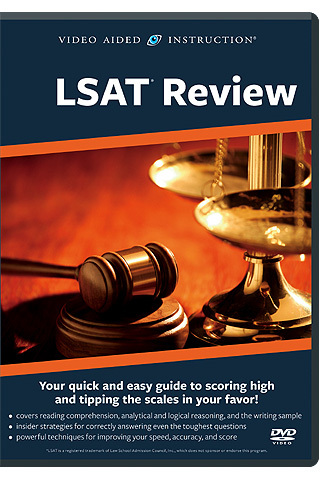 Now, with Video Aided Instruction’s new LSAT Review DVD course, it’s easier than ever before to excel on this important exam! Reading Comprehension — how to interpret even the most complex passages; the most common question types (and specific techniques for answering each); wrong answer types designed to trick you (and ways to recognize and avoid them). Analytical Reasoning — how to crack the often-baffling “logical puzzles” found on the exam; how to quickly capture the given information in visual form with a diagram, table, chart, map, family tree, etc. ; how to use logic and the process of elimination to work your way through the most confusing questions. Logical Reasoning — essential elements of every logical reasoning passage; how to recognize and evaluate hidden assumptions underlying any argument; the most common logical fallacies; the various question types you can expect (with simple techniques for answering each). the Writing Sample — how to analyze the essay prompt and develop an effective approach to the topic; how to brainstorm, plan, and outline an essay quickly and efficiently; special tips to make your essay a well-organized winner. Now you can tackle those dense reading passages, make sense of the most vexing analytical reasoning puzzles, decipher those convoluted logical arguments, and craft an impressive writing sample. So take the stress out of studying, make the most of your time, and maximize your LSAT score — with Video Aided Instruction!